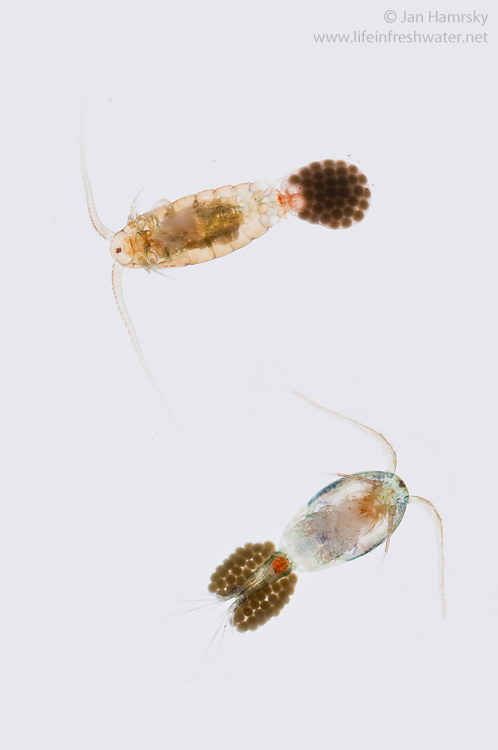 Filterers/collectors/predators – copepods feed mostly on algae, bacteria and small particles of detritus. However, some larger species consume other zooplankton as well. Copepods are found in large variety of water bodies. The most common they are in still water habitats such as ponds, lakes, wetlands, or backwaters of rivers. Swimmers using the longer pair of segmented antennae to push them through the water. Copepods are small and grow up to sizes around 2 mm. Almost all copepods reproduce sexually. Eggs are carried by adult females in the bundles attached to their abdomens. If needed, diapausing eggs can survive several years, until suitable conditions return into the habitat. Hatched young undergo several molts to reach an adult capable of reproduction. 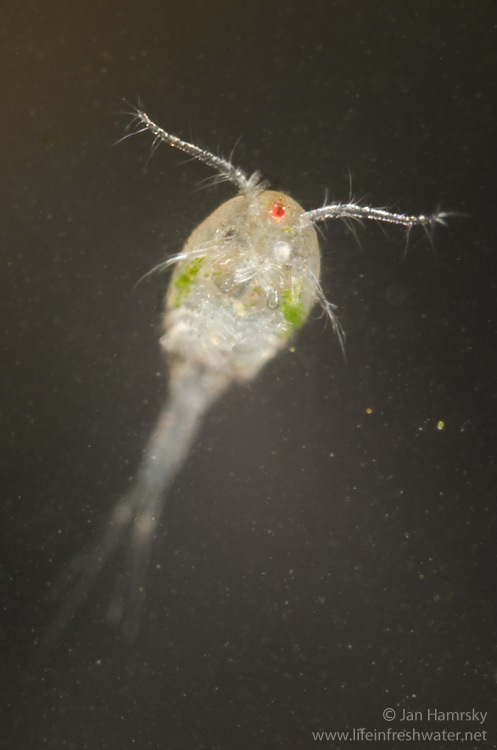 Copepods have a segmented, bullet-shaped body. The head is fused with the first one or two thoracic segments. Thorax is cylindrical, followed by narrower abdomen. Abdomen lack appendages, except for two spiny tails (rami). Copepods have a single (mostly reddish) spot eye. 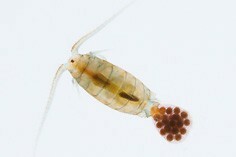 Adult female copepods of the order Calanoida carry single bundle of eggs attached to their abdomens. Calanoids often live in open water and by the surface, where they form the part of zooplankton. Adult female copepods of the order Cyclopoida have parried bundles of eggs. Cyclopoids mostly inhabit the upper layer of sediments on the bottom, as the members of benthos community.